Free wings and cheap pizzas ... what could be better? It's pretty undeniable that great food is part of what makes the Super Bowl so much fun. In addition to being fuel for a day full of leaping and shouting, a game-day feast is paramount to a proper party. Whether it's just a football fiesta with the family or the entire Fantasy Football League team, there are plenty of delicious recipes out there to feed sports fans — plus, the select few who really are just there for the wings. If cooking is not on the agenda, however, some popular chains have game day deals that you can take home or eat at the restaurant. Some show team spirit with promises of freebies, like when Bud Light flowed freely in the streets after the Philadelphia Eagles' win in 2018. Will anyone top that this year? Here's where to snag some good eats for great prices. As one of Super Bowl LIII's official sponsors, this pizza chain is dishing up a fewdeals. It also changed its name in honor of the big game on Tuesday. 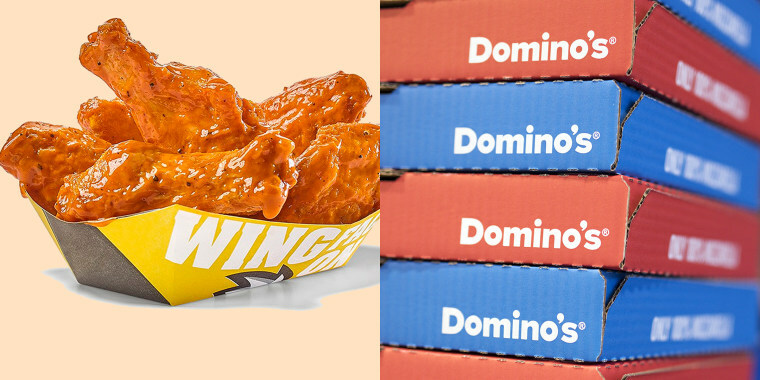 Customers can order a bunch of dishes from medium pizzas to boneless wings and desserts from the $5 lineup, as long as they order two or more. Large, two-topping pizzas are also just $8 if purchased online. Hardee's promises to give away free Made From Scratch Sausage Biscuits to everyone that visits a participating restaurant on the Friday, Feb. 8 from 7 a.m. to 10 a.m. But only under one condition: There has to be a "biscuit returned to the house." For none-football speaking patrons, that means the Los Angeles Rams or the New England Patriots have to return an interception for a touchdown. Similar to Pizza Hut's Lineup, Domino's offers a Mix & Match Deal: $6 each for a myriad of items from wings, salads, pastas, breads, brownies and, of course, pizzas when people purchase two or more. They also have a combo deal for $20, which includes bread to start, pizza, dessert and soda. We're willing to wait it out! Papa John's has five different Super Bowl deals catered to help party hosts. The packages range from the $43 "Game Day" (five large one-topping pizzas) to the $70 "Fan Feast" (five large one-topping pizzas, three bread sides and three desserts). Folks can also add the "Thirst and goal," which includes four large sodas for $8. Competing with the plentiful pizza and wings specials, White Castle's online-only Super Sack Attack includes 20 original sliders with cheese for $10 (a 30-burger Crave Case usually costs $29). If the kids' whole football team is coming over, five Super Sacks will set you back only 50 bucks for 100 burgers. Harold and Kumar have never been happier.